Upper Devonian, Middle Frasnian, Domanik Formation. The Domanik River, sample 2: fig. 1; the Chut River, outcrop 7: fig. 2 - sample 86, fig. 3 - sample 6, fig. 4 - sample 4, fig. 5, 6 - sample 1,2c. Fig. 1. 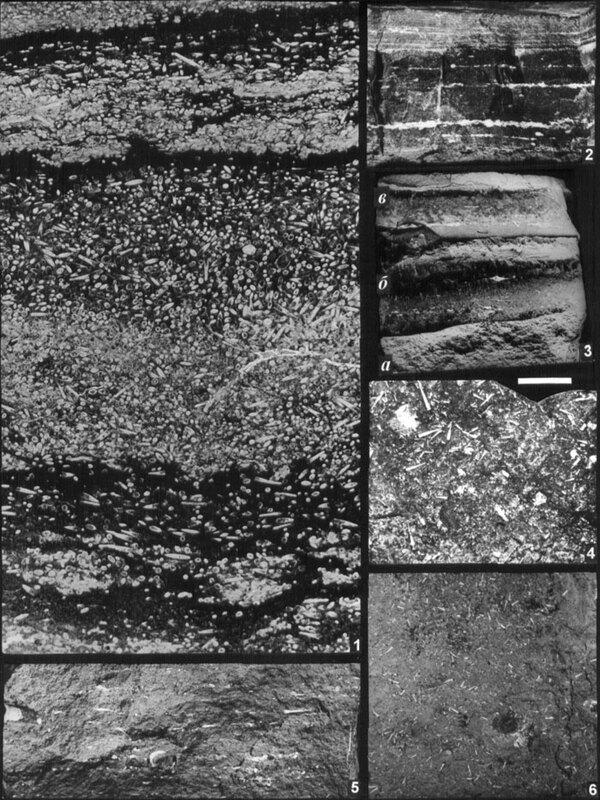 Macrolamination of tentaculitid cherty-clay limestone depend on number (0-70%) and orientation of tentaculitid skeletons: FF-L030/002, thin-section (bar=1,5mm). Fig. 2. There are the thin interrupted laminas formed by tentaculitid skeletons and its location in black and brownish-gray calcareo-cherty bituminous shale: FF-L003/0086 (=10mm). Fig. 3. Banded, thick-bedded, bluish-gray and blackish-brown bituminous silicite, part of calcareous silicite: FF-L003/006 (=9mm). Fig. 4. There is the disorderly placer of tentaculitid skeletons on bedding planes of black cherty shale: FF-L001/004 (=8mm). Fig. 5, 6. Brownish-gray silicite with Tentakulita, FF-L003/001,2c (=9mm): 5 - section, 6 - surface of bed.